Inspired the team at ASW Distillery. Simple, yet cosmic cocktail. Crafted by our friends at Recess, turmeric tonic is a spritzy combination of lemon and orange juices. It combines anti-inflammatory powers of freshly juiced turmeric and ginger and sweetened with a pepper-spiked honey-agave syrup. Combine Turmeric Base and Peppercorn Syrup, mixture yields enough for 12 drinks. Pour 1 oz over ice and top with a can of Montane Original. Combine all ingredients in a small saucepot and bring to a boil over medium heat. Reduce to a simmer and cook for 15 minutes, until reduced by 1/3. Strain and let cool. Crafted by our friends at the National in Athens, GA, the Sensory Portrait is a low calorie, restorative cocktail that contains antioxidants, immune boosting properties, & anti-inflammatory properties, to name a few. Combining a locally made ginger-infused honey, homemade rooibos tea vodka, tart cherry juice, lemon & Grapefruit-Peach Montane sparkling water, the Sensory Portrait will never make you feel guilty about catching a buzz. Build in a tin, add ice, top with Grapefruit-Peach Montane Sparkling Water, and roll into a glass. Pour a 750 ml bottle of vodka into an air tight container (doesn’t have to be anything super nice) and add 10 tsp of loose leaf rooibos tea. For easy straining, put the tea into a coffee filter and tie up with twine, making a makeshift tea bag. Let sit for 24 hours and strain. Equal parts ginger honey and hot water. Stir until fully dissolved. 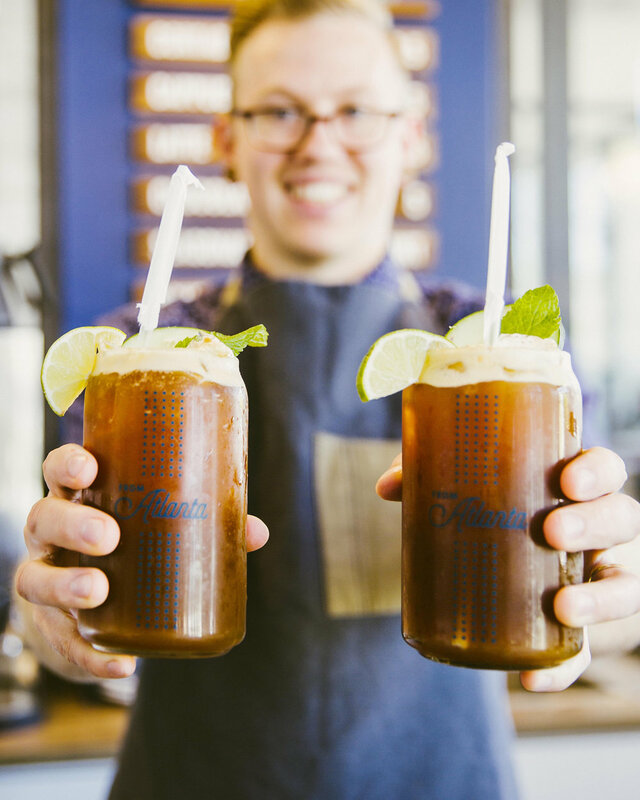 A refreshing riff on a mojito created by the coffee roasting masters at East Pole Coffee.